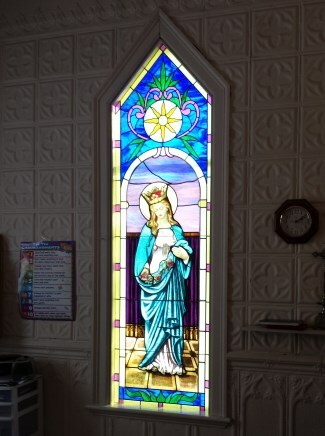 In December 2013, O'Brien Stained Glass installed a stained glass window in the sacristy of St. Mary's Church in Geneva, Minnesota. The central panel of the window came from a Catholic church near Rollingstone, Minnesota (Immaculate Conception at Oak Ridge). The origin of the window is unknown but is believed to date from the early 1900s due to the saddle bar bracing and the old lead. There were no records, and no member of the church knew where the window had come from. The Immaculate Conception church was demolished following the removal of the stained glass. St. Mary's Church in Geneva, Minnesota is a wood frame church on the prairies of western Minnesota that had been settled by Irish immigrants. Its stained glass windows are from Ireland and have a wide variety of color schemes, much like the patchwork quilts associated with country life. The church has many very old stained glass windows and while there are memorial plaques there is no painted glass. The common characteristics of all the windows are the ornamentation and the pattern work. Many of these windows have a decided Celtic character, and this is seen in the sun emblem that is repeated throughout the church. The challenge was to take this old stained glass window of Mary and make it work in the new surroundings. I accomplished this by using only the area of the original window that contained Mary and the background glass next to her. In the original window, she was framed between two slender columns that rose up alongside her where a Roman arch comes into play. The background around Mary suggests a portico with tiled floor, privacy curtain and resplendent sky in the background. This area was easy to remove for insertion into a new window. The new window contained an upper portion that directly reflected the Celtic sun pattern of the existing nave windows. The sides and bottom of the window joined with the top to frame in the preserved glass design from the window which I came to call "Mary, Queen of Roses" but which is more properly called "The Coronation of Mary." The overall shapes of the new window and the old window had many similarities in shape and style so it was fairly easy to meld the two together. I started the Glass Eye 2000 work first by outlining the window opening for the new glass in the sacristy (the priestly quarters where sacraments and vestments are stored). Then using the Glass Eye 2000 drawing tools I measured and apportioned space for the inset of "Mary, Queen of Roses." At this stage I had the window outline and an outline of the area where the old glass was to be incorporated. Next, I took a photograph of the Celtic portion of the old existing windows at St. Mary's and inserted it as background into the design. 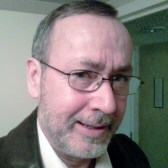 I sized the photo so that it could be placed approximately within the parameters of the new opening. I then drew the Celtic sun and the surrounding elements by tracing over the picture and resizing as needed. After that I drew in the sides and bottom into that same design. After all the new glass for the opening was drawn and colored, I imported a picture of the Mary insert as background and moved the Glass Eye 2000 design over the photo so that I had a fairly close representation of what the final window would look like. The clients were very pleased with the resulting image. The finished window looked very much as they had expected and hoped, and they were ecstatic! I believe that if the original donors of the Mary window could see the glass used in another church they would be very happy also. Kevin O'Brien operates O'Brien Stained Glass with his family and a few others. Most of their work is in restoration, and primarily in the Midwest. O'Brien Stained Glass is an accredited Full Service Studio Member of the Stained Glass Association of America since 2012.